Lately there has been a lot of past Poker After Dark shows being shown on NBC and if you are like me you are kinda getting sick of seeing the same show over and over again and you just want to see some new content. 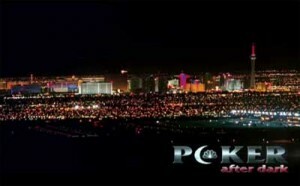 Well come January you will start to see more and more new shows of Poker After Dark being played on NBC. You will see the normal sit-n-go style freezeout where 6 players pay $20,000 and then play a winner takes all tournament style poker game. You will also see more cash game poker games where 6 players sit down at the table with their own money. If the games are anything like the past cash game poker games on Poker After Dark then you are in for a treat on the new shows that will be played in early 2009. Below is a list of the shows that will be played, but right now there is no set date for them to be played. Also I will list who will be playing in the games and whether or not it will be a cash game. 1. Magnificent Six: Daniel Negreanu, Phil Ivey, Doyle Brunson, Chris Ferguson and Howard Lederer. 2. National Pride: Its USA vs. Italy. Playing for Team USA is Chris Ferguson, Howard Lederer and Erick Lindgren. Playing for Team Italy are Marco Traniello, Dario Minieri and Max Pescatori. 3. Nets vs. Vets: (Cash Game) The online pros are Taylor “Green Plastic” Caby, Cole “CTS” South and David “Raptor” Benefield. The veteran pros are Doyle Brunson, Eli Elezra and Gabe Kaplan. 4. Celebrities and Mentors: The celebrities are Don Cheadle, Jason Alexander and Orel Hershiser. The mentors are Barry Greenstein, Gavin Smith and Phil Gordon. 5. Hellmuth Bash: (Cash Game) The players are Phil Hellmuth of course, Tom “Durrrr” Dwan, Phil Laak, Antonio Esfandiari, Kenny Tran and Bob Safai. 6. RailBird Heaven:(Cash Game) The name of the show is in regards to Full Tilt Poker’s RailHeaven. The players playing are Tom “Durrrr”, Phil Hellmuth, Gus Hansen, Daniel Negreanu, Phil Ivey, David “Viffer” Peat and Patrik Antonius. Hansen and Peat will be sharing time at the table. 7. International Week: The players that will be at the table include David Benyamine, Brad Booth, John Juanda, Alan Cunningham, John Phan and Ivan Demidov. 8. Dream Match 3: It’s amateur Arnold Thimons who gets to pick who he wants to play with and he chooses Daniel Negreanu, Jennifer Tilly, Phil Laak, Johnny Chan and The Mouth Mike Matusow.